It’s National Endometriosis Month, so let’s look at this chronic and debilitating disease this week. Endo’ is when tissue similar to the lining of the uterus grows in other places, including on the ovaries, the fallopian tubes, the pelvic side-wall, bowel, bladder, utero-sacral ligaments and in the Pouch of Douglas. Once thought to affect only women above 30, and those who hadn’t had children – not anymore. It is now thought to affect 10-20% of women, but it likely to be higher. Some women with Endometriosis may be symptom free. Endometriosis, we now know can affect women of any age after onset of menstruation. The recommendation was ‘have a baby’ or a ‘hysterectomy’. Both suggestions to a 14 year old seem ludicrous to me. I was officially diagnosed with Endometriosis via laparoscopic surgery at age 18. (As was my younger sister.) Endo’ has shaped my life. I’m pretty certain I had it from the time of my first menses at 13.5 years old, and also pretty sure my mother and paternal aunty had it also – but in those days they didn’t have a name for it. I have been mostly symptom free for over 10 years now and subsequent procedures have confirmed no evidence of endometriosis – apart from the intense pain the scar tissue from the ‘too many’ laparoscopies I’ve had. Scar tissue is also caused as each month passes, and the Endo’ lesions grow, causing more scar tissue and adhesions. I have to add though, that over the years when I go off my herbs and supplements for 6 months or so the symptoms start to return. Once back on my ‘Endo’-free regime’ for a month, the symptoms disappeared. These days I don’t even need ‘the regime’. 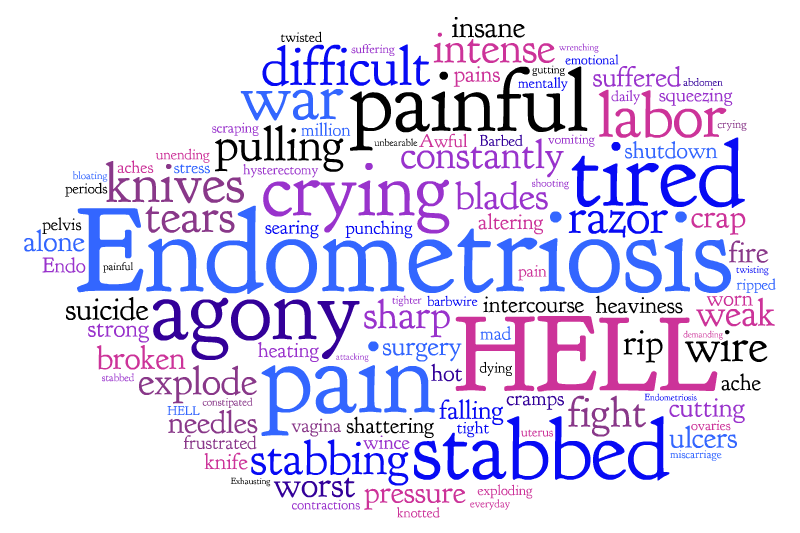 As a young girl I was told that there is no cure for Endo (and to ‘hurry up and have a baby’). That’s just not true. Plus, the stress that kind of advice creates is no doubt just making the Endo’ worse.